The name of Amnesia Haze XL (with the emphasis on Amnesia) should be read as a warning - this strain produces an end product with very high THC and CBD levels! She is the outcome of crossing the genetics of three big names in the cannabis community - Amnesia, Super Skunk and Haze and is one of the most psychedelic weeds on the market. The only drawback for commercial growers could be the flowering period of 12 weeks, but the high yields and extreme potency of the buds make up for the long wait. Amnesia Haze XL stays at a manageable height of 80-100cm and yields up to 600g/m² when reared in a grow-room under a 600W lamp. She performs well in both soil and hydroponic systems, as well as in SOG and ScrOG setups. If you cultivate her outdoors, pay close attention to bugs, proper irrigation and adverse weather or go the safe way and plant her in a greenhouse to avoid problems. An outdoor harvest can amount to 200 grams per plant. 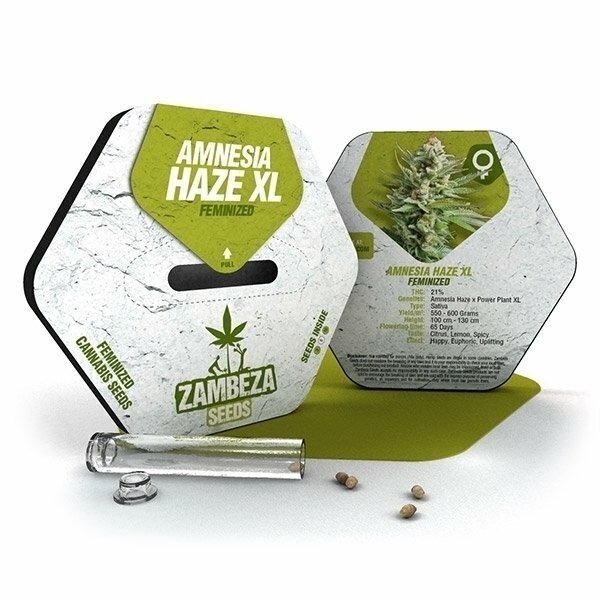 The buds of Amnesia Haze XL have a refreshing aroma and a fruity flavor with a slightly sour touch and induce an extremely psychedelic high - novices beware, this weed has the potential to erase your short-term memory almost completely, so don't be careless when smoking it in a bong!